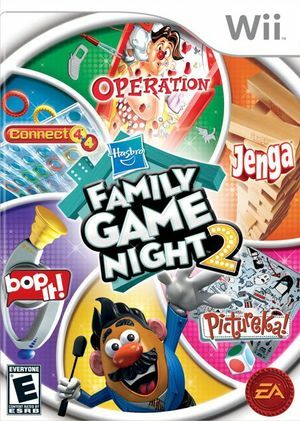 Hasbro Hasbro Family Game Night 2 is the sequel to Family Game Night, and includes the games: Operation, Bop It, Connect 4x4, Jenga, and Pictureka! Dual Core mode hangs after the intro. Disable Dual Core or use "Synchronize GPU Thread" to correct it. Refer issue 7143. The graph below charts the compatibility with Hasbro Family Game Night 2 since Dolphin's 2.0 release, listing revisions only where a compatibility change occurred. This page was last edited on 11 January 2018, at 12:06.